Roam free and feel the adventure of this wonderful online slot game. Noble and beautiful, Mustangs are wild and are the descendants of horses that were brought to the United States by the Spanish. With stunning illustrations in bright and tempting colours, ‘Mustang Gold’ is hard to resist and a treat to play. 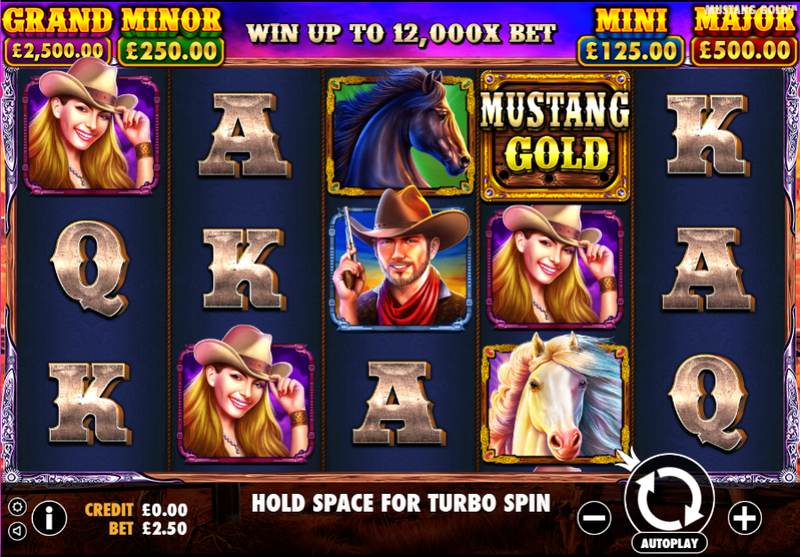 Gallop along to the 3 × 5, 25 lines video slot and feel the winning rush of wind through your gamers hair with ‘Mustang Gold’. Play 3D slots like Mustang Gold today! If you like ‘Mustang Gold’, then y’all better take a look at these games: ‘Treasure Horse’, ‘Gold Rush’, ‘Gold Train’ and ‘Wolf Gold’. All the Pragmatic Play’s games in their ever-expanding portfolio is packed with in-house and designed for excellent user experience. Click here to test play our slots games. You can line dance your way through this game accompanied by sleepy cowboy influenced music and the whinny of the Mustangs. The graphics are superb and make you feel like you are swinging away on your porch and looking out at the Western scenery. Feel free to check our guide with a list of the best UK slots online today. You can collect big wins from the money symbols or try to get lucky with the jackpots in the bonus game. You can collect more wins in with the free spins round too. 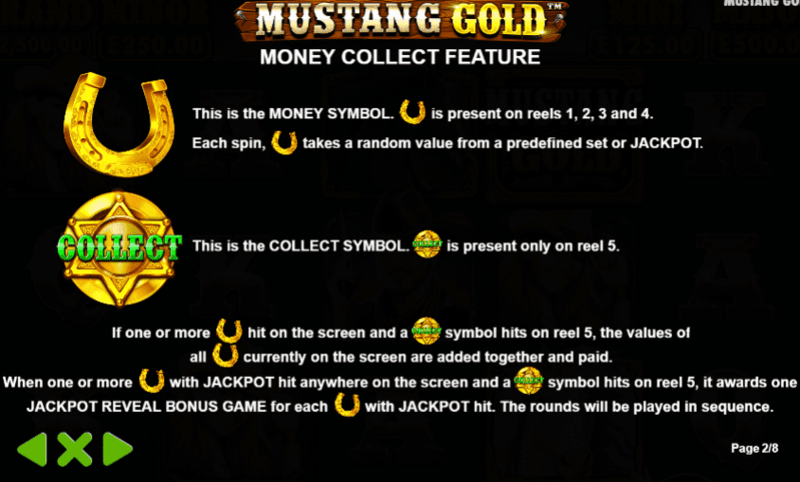 ‘Mustang Gold slot online has eight regular symbols, one wild symbol and a scatter symbol, not only that there are collect and money symbols as part of the features too. From low ‘letter’ paying symbols ascend the cow girl, cow boy and then the mustang symbols, whilst for ‘wild’ see the slot symbol and ‘scatters’ the campfire symbol. Features not only include a money collect game, but a free spins round, and four jackpots also. Horseshoes decorated with various money can be seen on reels one to four when spinning in base games and free spins. When hitting a collect symbol on reel five will award the money values seen. If one or more horseshoe money symbols arrive at once with a collect symbol on a spin, this will offer up the Jackpot Reveal game, with a chance to win one of the four jackpots. The Campfire scatter symbol on reels two to four will offer eight free spins. Giddy up and make it quick because ‘Mustang Gold’ is raring to make your playing experience one that you will never forget. You will have every chance to have to gain your very own gold rush if you clamber up into this slot-saddle of the wild, winning west….And with a chance to win up to a 12000 x bet? What are you waiting for? If you liked Mustang Gold, why not play Hercules High And Mighty?